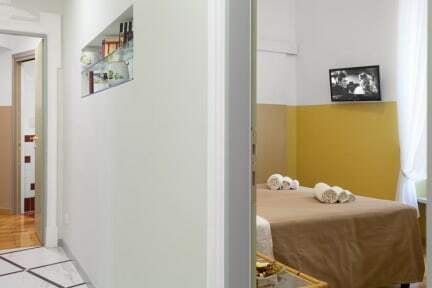 Located in a very typical city building between Colosseum and Termini station, B&B Roma Rondò offers offers 2 double luxury rooms with private bath, Wi-Fi, air drier, fridge, led tv, towels, linen, welcome kit, map, safe air conditioning / heating. Sweet breakfast is included. 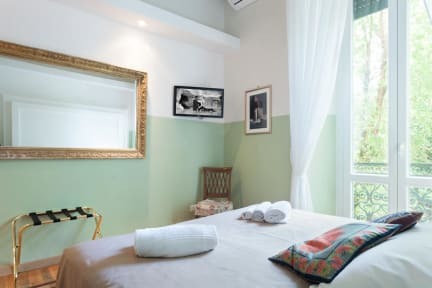 B&B Roma Rondò offers a cosy and typical atmosphere. You can reach all the main Rome's attractions (Vatican, Trevi, Spanish Steps) by subway. Tram 3, which is very near, leads to Trastevere. B&B Roma Rondò is 50 meters far from Manzoni Subway, 900 meters far from Colosseum , 600 meters far from San Giovanni Basilica, 100 meters far from Auditorium Antonianum,1,1 km from Fori imperiali, 1.6 km from Termini Station. Rooms have a very high and ancient ceiling with gorgeous pattern, parquet floors, rooms are modern and renovated with excellent shower, good lighting, comfortable beds. The neighbourhood is not touristy but easy to walk to the main attractions. Rooms are spacious, very clean, with a large balcony. Check in from 02:00 to 20:00 or till 2AM with extra cost of 30 euros (notify the owner). Cancellation policy: 72h before arrival. Payment upon arrival by credit cards. This property might pre-authorize your credit card.